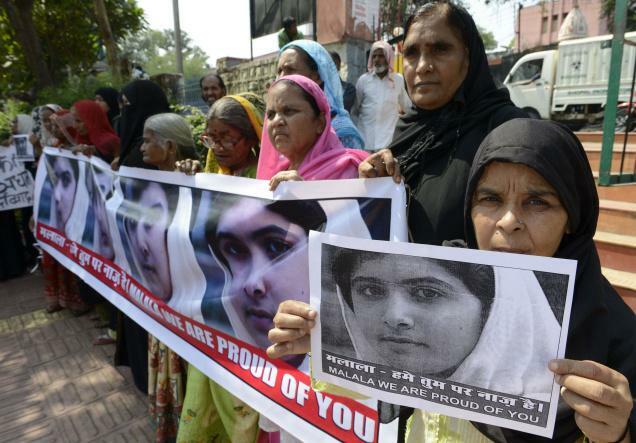 BHOPAL, October 13, 2012 : Victims and survivors of the Bhopal gas tragedy have extended their support to Pakistani teenager Malala Yousufzai who has stood up for women’s education. The youth was recently shot at and injured by members of the Tehreek-e-Taliban Pakistan for speaking up against the militant outfit’s diktats over education for girls in Pakistan’s Swat region. Ms. Yousufzai, who has been receiving support and adulation from all over the world for her struggle for women’s education, is recovering from the deadly attack at the Combined Military Hospital in Peshawar, Pakistan. The gas victims, under the banner of the Bhopal Gas Peedit Mahila Udyog Sangathan, held a meeting in the city’s famous Yaadgaar-e-Shahjahani Park on Saturday to express their solidarity with the daring peace activist. They formed a human chain in support of Ms. Yousufzai and prayed for her well-being. “We salute the young lady and the brave front she put up against extremist elements. We pray for her well-being and hope she recovers soon,” said Abdul Jabbar, a gas victim and convener of the Sangathan.